The Special Interest Group (SIG) for Aeroacoustics (SIGA) is concerned with the generation, transmission, and propagation of sound generated aerodynamically, i.e, by unsteady flows. The aim of this SIG is to provide a focal point in the UK for all researchers and practitioners working on the understanding and control of aerodynamically generated noise. Aerodynamically generated noise is a major issue for many companies in the UK such as the manufacture of aero engines (Rolls-Royce), noise from domestic appliances (Dyson), Wind turbines (VESTAS UK), Aircraft wings (Airbus-UK) and automobiles (Jaguar Land Rover). 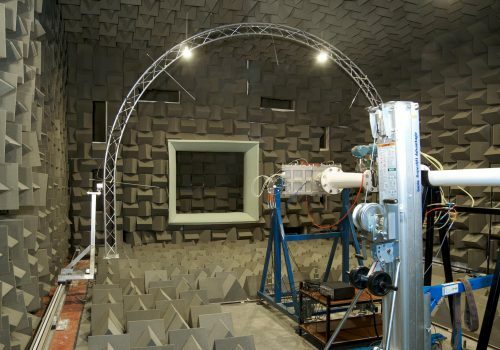 Moreover, UK Universities have been at the centre of aeroacoustics research around the world with a disproportionally large of research papers originating from UK Universities. Despite this activity in aeroacoustics research in the UK the opportunities for discussion and collaboration between different industries, different universities, and between industry and university, is nearly zero. The main goal of the aeroacoustics SIG is to bridge this gap and provide a focal point to allow this exchange to occur. Whilst the applications and objectives of research into aeroacoustics may vary across industry and university, there are a number of technical issues in common: (i) the accuracy, computational expense and limitations of modern numerical approaches to predicting aerodynamically generated noise; (ii) the development of analytic methods / semi-empirical relationships for predicting aerodynamically generated noise; (iii) measurement techniques to quantify the unsteady flow necessary to predict aerodynamic noise radiation; (iv) acoustic measurement methods required to quantify aerodynamically generated noise. The principal function of the aeroacoustics SIG is to provide a single focus for everybody with an interest in aeroacoustics to discuss their experiences in the above and other related issues. The benefit for those attending the SIG will be to: (i) share experiences in aeroacoustics; (ii) raise the profile of aeroacoustics nationally and reaffirm the importance of this subject to national industry and UK government; (iii) identify areas of common interest and develop collaborations as necessary; (iv) lobby national funding agencies to promote special calls in aeroacoustics. In the first instance it is planned to coordinate or merge with another aeroacoustics SIG allied to the EPSRC-funded UK Fluids network. It is planned to: (i) hold regular meetings with interested parties from academia, industry and government; (ii) hold a number of mini-conferences or workshops aimed mostly at post-graduate students of aeroacoustics; (iii) provide training in aeroacoustics. The precise role of SIGA will be defined between its members in the first six months of the network. A small management team comprising a balance of experienced and early-career researchers will be established to coordinate the activities of the SIG.